The timeline below highlights some of the major droughts and impacts that South Carolina has experienced in the past 100 years. For those interested in detailed hydroclimate analyses related to drought in the state, visit Carolinas Precipitation Patterns & Probabilities: an Atlas of Hydroclimate Extremes. Find examples of major drought impact types. Zoom down to a drought event by date. South Carolina experienced alternating wet and drought conditions. In June 2015, all counties were in an incipient or moderate drought, which was eased by rains in October 2013. By July 2016, lack of rainfall caused 32 counties to be recategorized as either incipient (28 counties) or moderate (4 counties) drought. Click the read more button to find out more about this drought event. The heavy rainfall from Hurricane Matthew in October 2016, caused flooding in most of the coastal plain, alleviating drought conditions in many counties. However, the rainfall from Matthew did not make it into portions of the Piedmont and Upstate. The lack of the moisture to intensify drought conditions in these areas and resulted in a declaration of severe drought in late October for Anderson, Oconee, and Pickens counties. 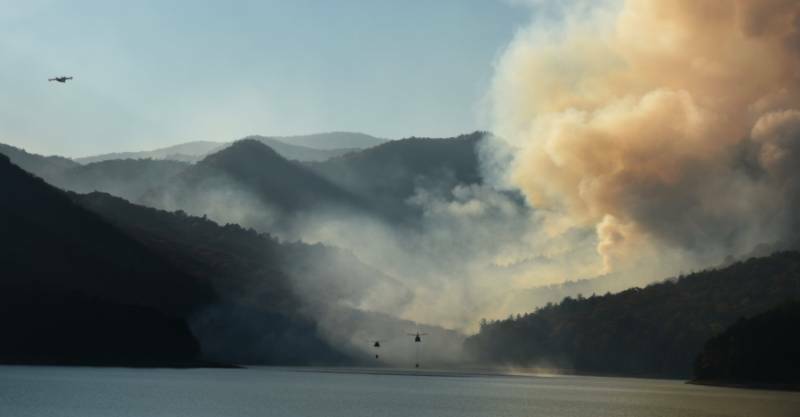 In November 2016, the Pinnacle Mountain Fire in the upstate burned more than 10,000 acres in and around Table Rock State Park. On the heels of the 2007-2009 drought, the Savannah Basin lakes were well below their target guide curves in March 2012. The inflows into Lake Thurmond for the following three-month period were the lowest recorded since 1954. The deteriorating hydrologic conditions reduced the amount of water stored in shallow and deep aquifers. Click the read more button to find out more about this drought event. Volunteer weather observers throughout the state noted various severe impacts to their water bill, garden quality, and health due to the dry environment. 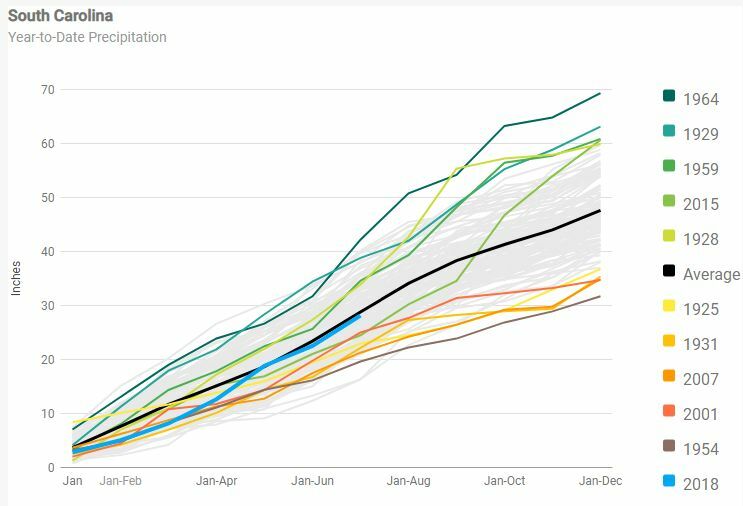 2007 was South Carolina’s third driest year on record, with a statewide average annual precipitation of 34.90 inches, which was 12.99 inches below the normal yearly rainfall total. 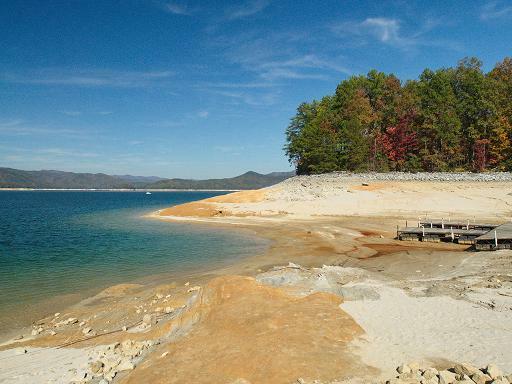 Drought affected water levels at some of the major lakes, such as Lake Hartwell, Lake Marion, and Lake Jocassee. 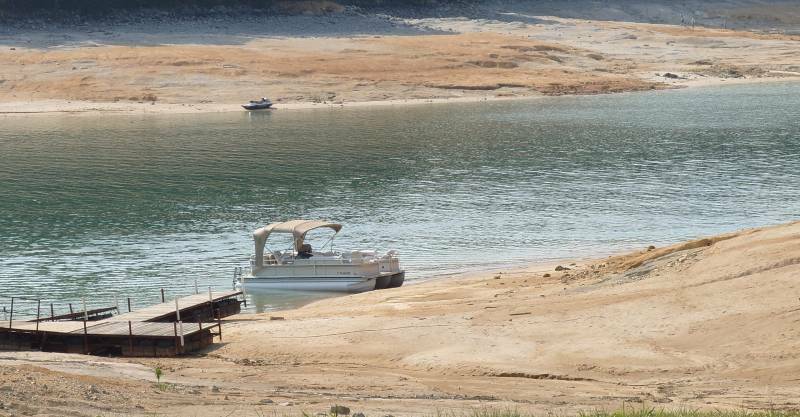 These lakes experienced record low levels which affected the local economy, and the drought impacted water supplies, irrigation capacity, and many water-related industries. Water restrictions were issued across the State to address water supply shortages. This prolonged four-year drought impacted the state in many drastic ways, with agriculture and forestry likely feeling the most impacts. The SC Forestry Commission estimated the total state losses from the drought to be $1.3 billion. 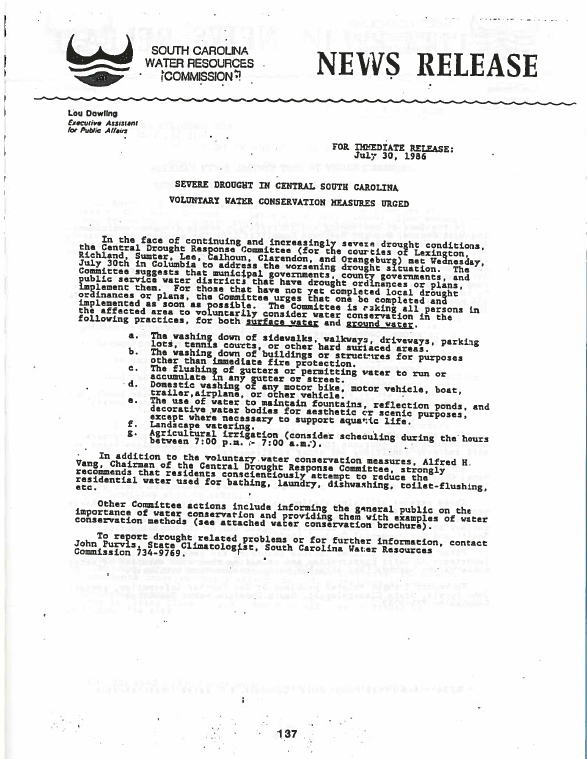 In August of 2002, the state declared every county to be in extreme drought status. Mandatory conservation efforts were enforced, stream flows reached record lows, and groundwater levels and reservoir storage were greatly diminished. Coastal areas such as Georgetown, SC felt the impacts of saltwater intrusion, and many areas, such as Cheraw, SC, had their driest years on record. 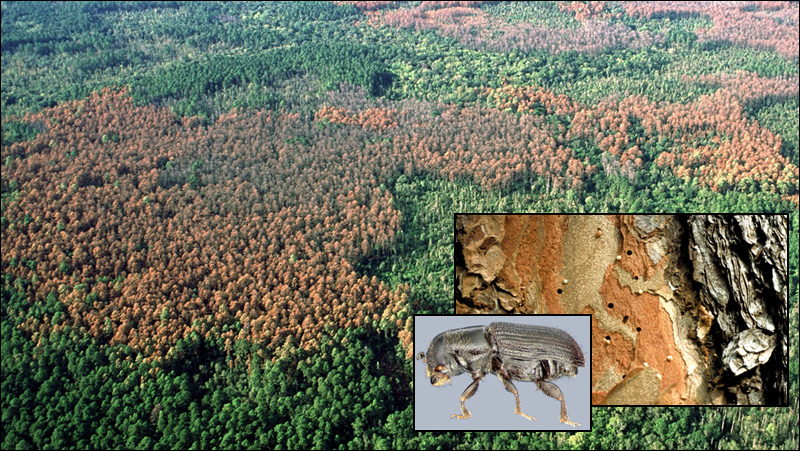 Widespread forest fires were a persistent issue along with the disease-spreading southern pine beetle that caused an estimated $210 billion in losses. A more detailed description of this drought event can be found in CISA's Atlas of Hydroclimate Extremes. Disaster areas were declared in 45 counties due to drought losses-- $219.9 million in agricultural losses, and $8.1 million in forestry losses attributed to forest fires. The forest fires exceeded normal monthly averages by up to ten times of expected; over 19,000 acres were burned in January 1985 alone. Tourism and recreation were affected due to the low reservoir levels, but the water supply wasn’t affected due to outside reliance on groundwater, etc. There were approximately 29 drought-related deaths due to the intense heat. These years all had rainfall deficiencies, with a few months in the period serving as moderately wet exceptions. 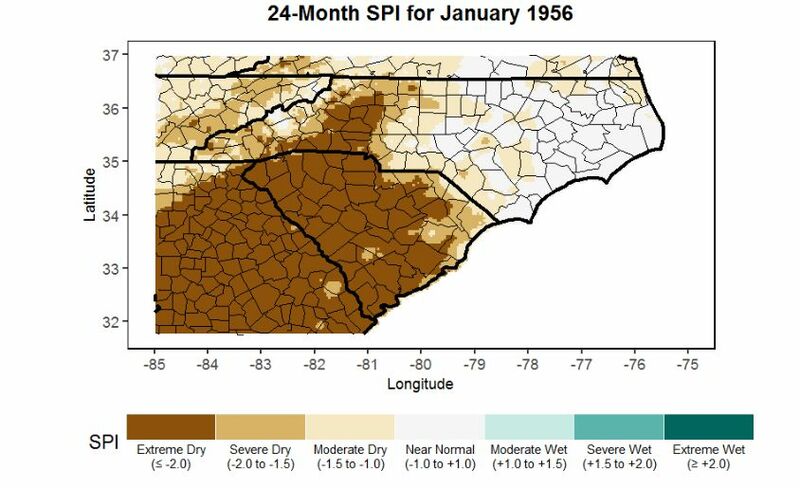 1954 set records for both dryness and heat, significantly affecting agriculture, and as of 2018, remains as the driest year in South Carolina history, with an average annual precipitation of 32.96 inches. Forest fires burned tens of thousands of acres throughout the state, and streams and lakes had low stage levels. In 1954, small streams became dry and more major rivers, such as the Black and Coosawhatchie, stopped flowing for extended periods. Water use in several cities and towns was decreased, as was the availability of power. The recurrence intervals for this drought are between 30 and 60 years. This prolonged drought diminished soil moisture for several ongoing years. The lack of soil moisture led to decreased crop germination and increased agricultural losses. 1931 and 1933 were record drought years, with the recurrence interval for a returning drought of the same intensity at more than 25 years. The year 1931 is now South Carolina’s fourth driest year on record, with an average annual precipitation of 35.37 inches. 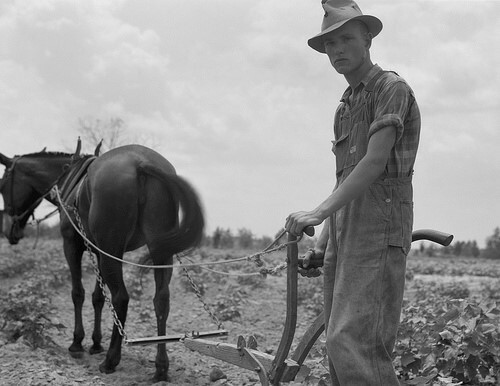 In 1933, considerable replanting was necessary during the spring in many portions of the state, especially for cotton. Precipitation was the least in the southern portion of the state. 1925 was the most intense drought year on record at the time, with a rainfall deficiency of 18.23 inches. The average annual rainfall for the year 1925 was 36.73 inches, 3.3 inches lower than the previous record from 1911. Every sector from the state was impacted — agriculture struggled, hydroelectric power was limited, and these limits impacted the textile mills and other industry. With over half of the state’s workers in the agriculture sector, nearly 16% of farms in South Carolina were abandoned, and a quarter-million people left the state for better opportunities elsewhere. Rainfall remained below normal for a couple of years after 1925, although 1925 was the year of the most severe drought. 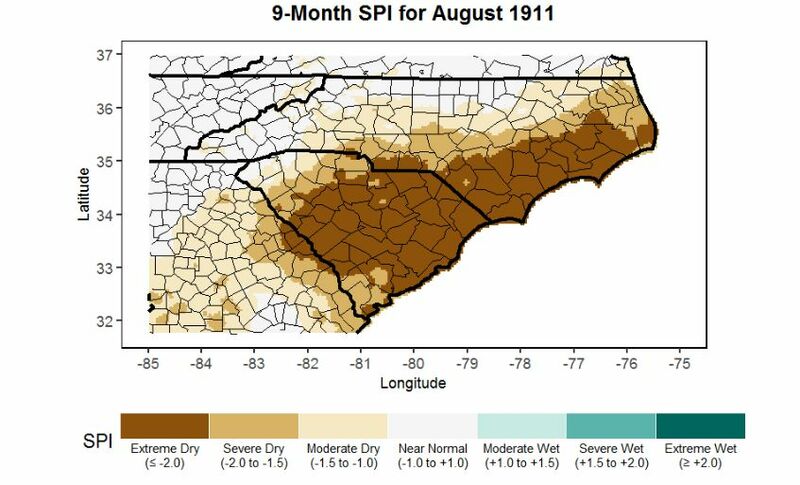 Drought conditions prevailed in South Carolina from November 1910 – August 1911. May 1911 presented the most intense drought month during this period. Five stations in the extreme southeastern portion of the state had no appreciable rainfall and, at the time, it was the driest May on record since 1787 in Charleston1. As a whole, the statewide average precipitation was 2.06 inches, which is 18% of normal for May. River stages remained very low, especially in west central, central, and coastal SC. These low river levels led to water use restrictions for citizens of SC and a decrease in water use for power resources. 1The record kept in Charleston dates back to 1787, before the establishment of an official station, excludes 35 years in the 125 year period, but May of 1911 is still assumed to have been the driest since 1787. Back to Top Go back to top of page.